A previously healthy Japanese man aged 67 years was admitted into our hospital after presenting with fever, abdominal pain and watery diarrhoea (occasionally bloody) for 2 weeks. At presentation, he had a fever of 38.9°C and diffuse abdominal tenderness. His white cell count was 7440/μL, C reactive protein 22.18 mg/dL, serum albumin 1.8 g/dL, potassium 2.9 mmol/L and blood urea nitrogen was 26.5 mg/dL. Abdominal CT revealed pancolitis with mild splenomegaly but no hepatic lesions. Stool analysis and culture was negative for pathogenic bacteria, Clostridium difficile and tuberculosis. After conservative treatment with intravenous drip for 2 days, a sigmoidoscopy was performed. Multiple surface to deep ulcerations with yellowish exudate was observed in the rectosigmoid region (figure 1A). Mucosal biopsy revealed acute colitis with the presence of haemophagocytic amoebic trophozoites (figure 2, arrows). Microscopic examination of the patient's stool also confirmed the presence of Entamoeba histolytica trophozoites and amoebic serology was positive, confirming the diagnosis of severe amoebic colitis. Clinical symptoms improved remarkably after a 2-week course of metronidazole and he was discharged 3 weeks after admission. Follow-up colonoscopy after 6 months revealed multiple ulcer scars throughout the entire colon (figure 1B). The patient was also screened and tested positive for HIV infection, after which he was referred to a tertiary care hospital for treatment. (A) Endoscopic image of the rectosigmoid region revealing multiple surfaces to deep ulcerations with some yellowish exudate. (B) Endoscopic image of the cecum and ascending colon 6 months after discharge revealed multiple ulcer scaring. 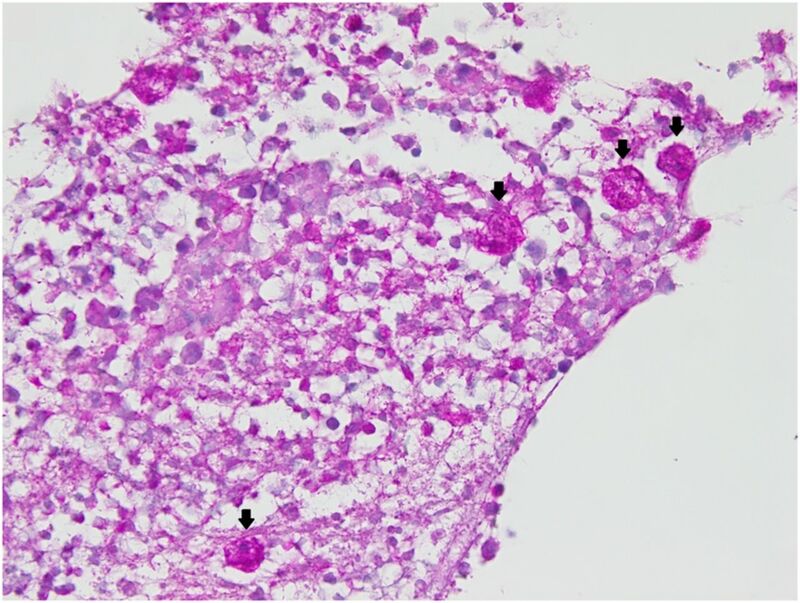 Histological examination with periodic acid–Schiff (PAS) staining confirmed the presence of haemophagocytic amoebic trophozoites (arrows) along with chronic inflammatory changes. Clinical symptoms as well as endoscopic findings of amoebic colitis may closely resemble those of inflammatory bowel diseases and treatment with corticosteroids may cause a mild form to progress to fulminant colitis.1 ,2 Although HIV-infected patients may have a higher prevalence of E. histolytica infestation, they are not necessarily at increased risk for developing invasive disease.3 Nevertheless, progress to fulminant colitis in HIV patients have been reported, even though the exact mechanism is unclear. Clinical symptoms as well as endoscopic findings of amoebic colitis may closely resemble those of inflammatory bowel diseases. HIV-infected patients may have a higher prevalence (not invasive disease) of Entamoeba histolytica infestation. Early diagnosis and treatment is important to avoid progress to fulminant colitis.
. Infection by human immunodeficiency virus-1 is not a risk factor for amebiasis. Am J Trop Med Hyg 2005;73:296–300. Contributors EWTY prepared the manuscript. MS provided important instructions.